When it comes to dog care, proper grooming is essential. Many pet parents realize the importance of brushing their pups with the right dog brush, washing their pups with a specially formulated dog shampoo, and giving their furry friends manicures with the best nail clippers for dogs; but, there’s another part of grooming that a lot of dog owners forget about: oral hygiene. While it’s true that dogs don’t tend to tooth care in the wild, veterinarians do say that caring for domesticated dogs’ teeth is extremely important. And that’s exactly why there are tons of toothpastes for dogs on the market. But with so many options to choose from, how do you know what is the best dog toothpaste? To help you narrow down the options, we’ve assembled a panel of experts, including veterinarians and professional groomers and have read through countless dog toothpaste reviews. Our research has lead us to select what we consider to be the best toothpaste for dogs currently on the market. Now that you have seen our top five picks, let’s examine each one in more detail. Below, we offer an in-depth look at what we consider to be the best pet toothpaste. We discuss the features of each one, the benefits that they provide, and highlight what it is that we like about each product. After reading the reviews, once you have chosen the best dog toothpaste for your pup’s needs, click on the buttons to find the best prices available on Chewy and Amazon. 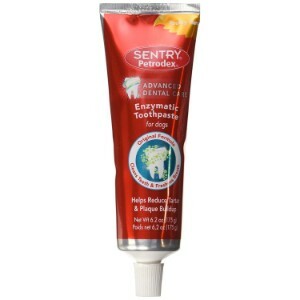 Our first pick for the best dog toothpaste is Petrodex Enzymatic Toothpaste. When it comes to enzymatic toothpastes for canines, Petrodex is one of the most highly regarded brands. 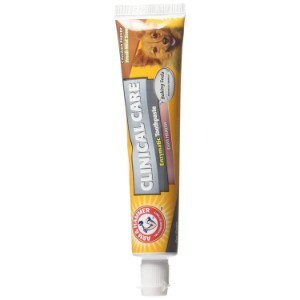 Formulated specifically for pets, this toothpaste is a blend of all natural ingredients that contain enzymes, incuding Aspergiullus niger, and other patented enzymes that, such as alpha-galactosidase and glucose oxidase. According to our expert panel, this formula effectively removes tartar and plaque buildup and freshens the breath. According to users, Petrodex Ensymatic Toothpaste effectively whitens the teeth, too. In fact, many people reported that this toothpaste made their dogs’ teeth noticeable whiter. The poultry flavor of this toothpaste will make it very appealing to your dog, so your four-legged friend will actually look forward to brushing. And since it’s a non-foaming formula, no rinsing is required, so cleaning your pup’s teeth with this toothpaste only requires one step. 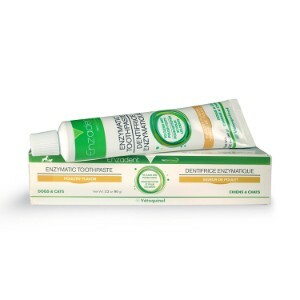 Final Verdict: Overall, we think that Petrodex Enzymatic Toothpaste is a great choice. According to our expert panel and the dozens of positive reviews on Amazon, it is highly effective for combating bad breath, removing plaque and tartar, and whitens the teeth, too. 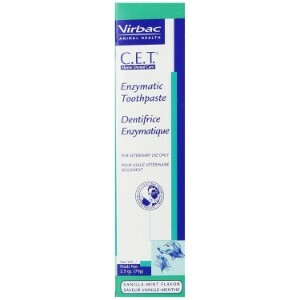 Next up on our list of the best toothpaste for dogs is Virbac CET Enzymatic Toothpaste. It’s specially formulated for dogs, so you can rest assured that it is safe for your furry best friend. This toothpaste also contains natural ingredients that offer antibacterial action. These ingredients not only help to remove plaque and tartar buildup, but they also prevent the re-growth of these agents that can cause serious harm to your dog’s teeth and gums. In addition to the being able to remove control plaque and tartar buildup, CET toothpaste also effectively reduces bad breath. Users have said that they noticed a marked improvement in their dogs’ breath after using this toothpaste. And, since it’s a non-foaming formula, brushing your canine companion’s teeth only requires one step. Lastly, this toothpaste is available in several different flavors, including beef, malt, poultry, seafood, and vanilla-mint, so you’ll definitely be able to find an option that will appeal to your pooch. Final Verdict: While there were some complaints about the flavors and smell, we think that’s because everyone (dogs and humans) have different senses of taste and smell. With that said, this toothpaste provides highly effective results and is easy to use, as noted by the numerous positive reviews that users have posted; and as per what our panel of experts stated. When you purchase the Ortz Toothpaste and Toothbrush Set, you’ll have everything you need to ensure that your dog’s oral health is in tip-top shape. As you would expect, the toothpaste is formulated specifically for dogs. It targets the most common canine oral health problems, including plaque buildup and bad breath. It also provides effective tartar control, both eliminating this dangerous substance and preventing it from developing. The toothpaste is made of non-toxic ingredients, which means that it’s not only safe for your pup, but it’s safe for the environment, too. Of course, when it comes to taking care of your pup’s teeth, you’re going to need to use the right toothbrush. 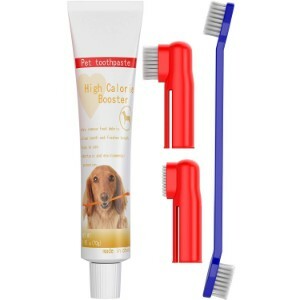 While there are a lot of excellent toothbrushes for dogs, what’s great about this option from Ortz is that it comes with a high-quality toothpaste AND three different types of toothbrushes: a long-handled brush and 2 silicon toothbrushes (one for large teeth and one for small teeth). The toothbrushes are expertly designed to reach all of those hard-to-reach surfaces in your dog’s mouth, so you can rest assured that his teeth will be in great shape. Final Verdict: Overall, our panel of experts and the majority of people who have used this dog toothpaste and toothbrush kit from Ortz say that they are very pleased. The toothpaste does exactly what it’s supposed to do, and the toothbrushes make it a complete package for canine oral health care. This pet toothpaste from Enzadent is specially formulated to combat the oral health issues that dogs are particularly prone to, such as bad breath and plaque buildup. The Triple Enzyme System of this toothpaste makes it highly effective for combating plaque and tartar buildup; it also prevents these dangerous substances from building up on your pet’s teeth, so it truly protects his teeth and gums. Since this toothpaste doesn’t foam, you don’t have to rinse your pup’s mouth out after using it, which makes those brushing sessions a lot easier. It’s also safe to swallow, so there’s no need to worry about your furry friend being harmed. Users say that the poultry flavor of Enzadent Pet Toothpaste is highly palatable. They actually said that their dogs’ enjoy having their teeth brushed, which is a major plus if your dog gives you a hard time when you’re brushing his teeth. The majority of the reviews on Amazon state that this toothpaste is very easy to use and that it offers great results. Our panel of experts also said that they are impressed by the ingredients used in this toothpaste, and that it offers very effective results. This toothpaste features a Triple Enzyme System formula that effectively combats plaque and tartar buildup. It also prevents the buildup of these substances in the future, with regular use. Dogs find the poultry flavor very enjoyable, which makes tooth brushing a lot less of a hassle. The no-foam formula is safe to swallow and makes this toothpaste very easy to use. The price tag is very affordable for such a high-quality product. Final Verdict: Given the several 5-star reviews on Amazon and the great scores that our experts awarded this toothpaste, we think that it’s a great option for keeping your dog’s mouth clean and healthy. We like that it’s easy to use, and most dogs do seem to enjoy the flavor; however, if your pup is finicky, it may not appeal to him. Last, but certainly not least, on our list of the best toothpaste for dogs is Arm and Hammer Dog Dental Care Toothpaste. Arm and Hammer is a trusted manufacturer of countless hygiene products for humans, so you can be sure that they offer great quality products for canines, too. Of course, this toothpaste is specially formulated for dogs. It contains all natural ingredients that are safe for your dog and that have been proven to provide breath freshening qualities. Special herbs offer soothing qualities, so if your furry friend has sensitive gums or if they have been damaged by tartar or plague, than this toothpaste will offer relief. Like most Arm and Hammer products, this dog toothpaste contains baking soda, which has natural enzymatic properties. It’s safe for use with dogs of all sizes, including small breeds, like Yorkshire Terriers and Pekingese, medium breeds, like West Highland White Terriers and Cocker Spaniels, and large breed dogs, such as Irish Wolfhounds and St Bernards. As a pet parent, ensuring your furry family member receives the very best care is a top priority. To that end, if you’re like most pet owners, you’ve probably done extensive research about all the different dog products that are on the market so that you can choose the best of the best. For example, you’ve carefully selected the best dog crate, a supportive and comfortable dog bed, a safe and spacious dog playpen, a dog house that offers all the bells and whistles, and a spacious outdoor dog kennel. And of course, you have also made sure that your pup is fitted with the best dog collar or dog harness, and you’ve even chosen the best dog food and dog bowl. Since making sure that your pooch receives the very best of care is so important to you, there’s one thing that you don’t want to forget: ensuring that his teeth are well taken care of. Unfortunately, a lot of dog parents overlook the importance of canine oral hygiene. But it’s something that really needs to be addressed. If you want your pup’s teeth to be as healthy as possible and you want to combat his bad breath (let’s be honest: a lot of dogs’ have really foul breath! ), then you’re going to want to choose the best toothpaste for dogs. But, if you’ve never purchased toothpaste for a dog, you probably have a lot of questions. In this section of our review, we will answer questions that a lot of pet owners have about dog toothpaste. We cover why it’s important to brush your dog’s teeth, things to consider when choosing toothpaste for your dog, and several other important things related to dog toothpaste. With the information presented in this portion of your review, you’ll be well-informed so that you can choose the very best product for your pup. Just like it is for humans, oral health is important for canines; especially domesticated dogs. Dogs in the wild hunt and forage for their food, and the acts that are involved allow them to naturally remove plaque and tartar buildup. However, since domesticated dogs don’t hunt and forage, tartar and plaque buildup can become a serious problem. While there are several interactive dog toys that can help to control the buildup of these harmful substance, and you can offer a dog treat that’s designed to eliminate plaque and tartar, there’s only so much that these products can do. That’s why it’s important to take the time to actually brush your furry friend’s teeth. Remove plaque and tartar buildup. These substances can wreck havoc on your dog’s mouth. They can cause bad breath, erode the gums, and lead to tooth loss. By brushing your pup’s teeth with high-quality toothpaste, you can help to prevent these problems. Remove food debris. Like humans, dogs get food stuck between their teeth. When food collects, bacteria grows, and bacteria growth can cause serious issues. Brushing regularly with the best toothpaste for dogs will help to get rid of that food debris. Fight bad breath. If your dog is prone to bad breath, brushing his teeth, especially with a toothpaste that is designed to combat bad breath, can help to eliminate the problem. You’ll enjoy getting those puppy licks a whole lot more! Strengthens the teeth. When tartar and plaque are controlled, and food debris is eliminated, the chances of gum disease and tooth loss are far less. Your dog will have stronger teeth, which means that eating and playing will be a lot easier. Given all of these benefits, it’s important to get in the habit of brushing your canine companion’s teeth on a regular basis. Pet-friendly. Of course, the first thing you should look for is a product that is made specifically for dogs. You should never, under any circumstances, use human toothpaste. It might contain chemicals that might be safe for you to use, but aren’t safe for dogs. You don’t swallow when you brush your teeth; you spit the toothpaste out. But your dog does swallow toothpaste, and those chemicals can cause serious problems; they can damage the lining of his stomach or cause gastrointestinal problems, for example. So, always make sure that the toothpaste you choose is formulated for pets. High-quality ingredients. In addition to containing ingredients that are safe for dogs, you should also look for a product that is free of artificial sweeteners or flavorings, as well as alcohol. A lot of the toothpastes for dogs that are on the market do contain these ingredients, and they can actually damage his teeth and gums instead of strengthen them. Easy to use. The best toothpaste for dogs will be easy to use. No-foam formulas that don’t require rinsing and can safely be swallowed are the ideal choice. They are easy to use because they don’t require the extra step of rinsing. Palatable flavor. A lot of dogs don’t like having their teeth brushed. By selecting a toothpaste that features a pleasing flavor, such as poultry, beef, or fish, your dog will actually look forward to brushing instead of running away. Oral health is as important for your canine companion as it is for you! It helps to combat plaque and tartar buildup, prevents gum disease, removes food debris, and, of course, it freshens your pooch’s breath. In order to ensure that your dog’s teeth are being cleaned as effectively as possible, it’s important that you select the best toothpaste possible. There are a lot of options to choose from, but, as mentioned, not all dog toothpastes are made the same. Unfortunately, many contain harmful chemicals that can actually worsen the health of your dog’s mouth, and can cause a number of other problems, too! If you want to ensure that your dog’s oral health is its absolute best, use a high-quality toothpaste, like one of the five options we’ve listed in this review. If you do opt to use a different toothpaste, make sure that you choose a product that is made specifically for dogs and offers the features that we mentioned above. By brushing your dog’s teeth on a regular basis with the best toothpaste for dogs, you can ensure your pooch will have healthy teeth and fresh breath – which will make both of you happy!